When an athlete approaches me for coaching, I have a big task on my hands. There is a lot of information I have to gather about them so I can write the most effective training programs possible. For each athlete, there are many small details that affect the way they will respond to training and my job as a coach is to find out what those details are and address them in training. Since I conduct the majority of my coaching via email, I have developed some specialized questionnaires to help me extract these details about each new athlete. I then pair that with the general knowledge base I have built and the results speak for themselves. But how can you as a powerlifter do this for yourself? How do you get a training program tuned in to your body’s unique responses? Fortunately for you, you have much of the information you need already. 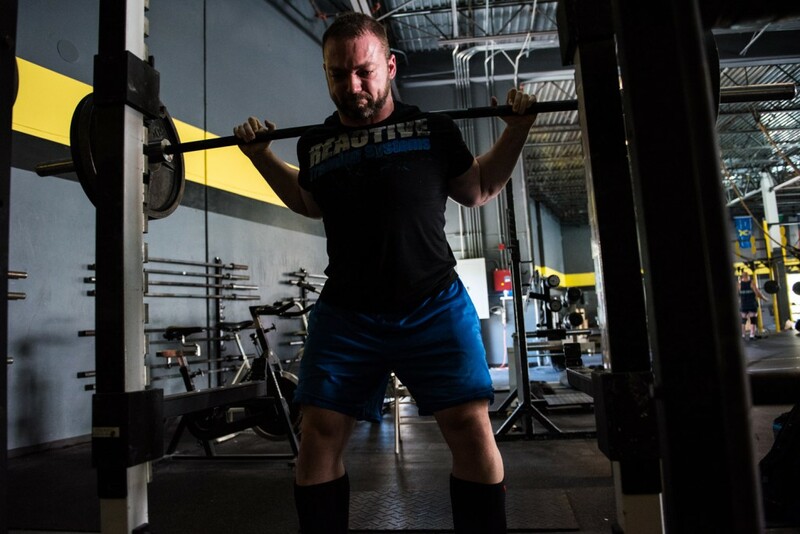 Many lifters who are in the intermediate and above stages of powerlifting will already know many nuances of how they respond to training as well as the fundamentals of how a powerlifting training program should work; things like having adequate recovery, training with low reps, etc. Where many powerlifters get lost is when topics come up such as volume, intensity, frequency, specificity, etc. Although understanding each of these topics at a high level can get complicated, a good working knowledge of them doesn’t have to be. I developed the Reactive Training System in part to provide athletes with this fundamental working knowledge. When I bring in a new athlete to RTS, one of the first things I teach them is about intensity. Different people have varied perceptions of what intensity means, but for the purposes of powerlifting, it almost always refers to the percentage of your 1RM. Intensity is the variable that can make the greatest impact on your training effectiveness. To put it another way, your intensity will be the main thing that determines whether you get stronger, get bigger, build endurance, and so on. As you look to educate yourself more and more on your training, pay special attention to what effects are produced by which intensities. There are several ways programs seek to measure training intensity. Some require the athlete to lift a percentage of their 1 rep max. Others are based off of a 1 rep max minus ‘X’ number of pounds. Still others use a certain rep max as a gauge. When I bring a new athlete into the program, we will usually use a sophisticated version of the last example. To understand how this works, you need to first understand RPEs. RPE stands for Rate of Perceived Exertion, or basically how hard a particular set felt. It’s fairly common to hear people tell about an “easy triple” or a single they really had to grind out. These terms are fairly ambiguous and will likely mean different things to different people. We use a numerical scale from one to ten based on how hard a set feels. Each number on the scale has a specific meaning. RPEs below 7 are usually for warm-up sets and restoration work. The benefit of using an RPE is that it gives you the ability to be much more exact with how the weights felt. It might seem cumbersome at first to rate each set on a number scale, but you’ll quickly become used to it and able to use it comfortably. What does that have to do with Intensity? This type of intensity recommendation has many benefits over percentage guides. Probably the biggest benefit is that it is flexible with your body. As you get stronger, the weights will naturally get heavier. If you’re having a bad day and you’re not capable of what you normally can do, it automatically adjusts the weights to fit your ability on that particular day. It’s interesting to note that your body responds to the weight on the bar and what you do with it – not to a magic percentage. The only thing a percentage tries to do is get you to load the correct weight. When used properly, it’s not a bad way to go. But they aren’t very often used properly. It’s much easier to use a rep-and-RPE pairing both from the perspective of a coach and of an athlete. It requires less “busy-work” on the part of the coach and the increased flexibility will pay big dividends to the athlete as well. How should I implement these ideas? Percentage-based programs are probably the most common at this point in time. So, I’d like to address specifically how to convert your percentage based program into a RPE based program. Using the charts above, you would find the reps your program calls for on the top axis. You then trace down until you find the percentage that your program requires. If you follow that line to the left, you will find the appropriate RPE to train with. Additionally, if you need examples of what speed these lifts tend to look like, take a look at the Instagram accounts below. For example, let’s say your program requires you to do three reps at 85%. First, you find the column that says 3 reps. Then, trace down until you find 85%. Finally, follow that line left to find your RPE. In this instance, you can see that you need to train with 3 reps at a 9 RPE. This will approximate your 85% loads for most athletes. 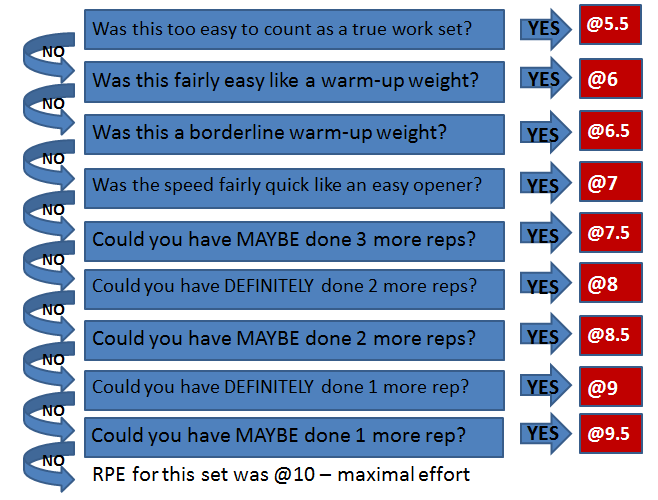 A word of caution – some will want to in turn estimate their 1 rep max using this chart. I strongly recommend you don’t do that with the chart given above. While intensity dictates a large portion of the training effect, the other side of the coin is how to auto-regulate your training volume in order to produce optimal training results. 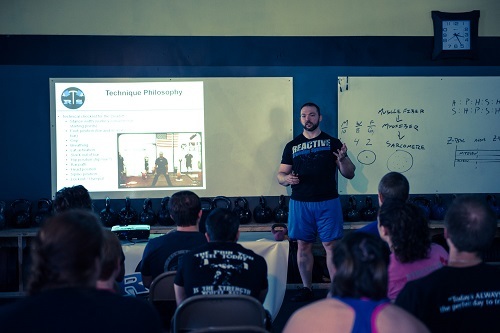 But first, I would like to discuss why auto-regulation is important when it comes to training volume. You see each person responds to training differently. We all know people who can handle large amounts of volume and seemed to be unaffected. We all also know someone who cannot handle such large volumes without overtraining. It’s important to realize that there is a whole range of training that is neither under training nor overtraining. And what’s more — there us a sweet spot somewhere in the middle that will produce the greatest training effect. So how do you figure out where the sweet spot is, since it will be different for each person? The answer is auto-regulation. With auto-regulation, training volumes automatically adjust depending on what’s best for you. There are no guessing games; much less “trial and error”. There are several ways to auto-regulate training volume, but the common method used in Reactive Training Systems is called fatigue percentages. This method has a lot of benefits for the user. Not only is volume automatically adjusted to the needs and fitness levels of the lifter, this adjustment will occur in real time. This means if you are feeling sick, volume will be adjusted. If you are not getting any sleep, volume will be adjusted. This is a very powerful training tool that you can use to enhance your training every day! Focus, Mike! Gimme something I can use! When using fatigue percentages, you’re trying to measure a loss in your ability to move weights. If you’ve first implemented the RPE system discussed above, this will be much easier to understand. Look at your protocol for the day. Let’s say you plan on doing sets of 3 reps from an 8 to 9 RPE and you plan on using a 5% fatigue percent (more on this later – 5% is fairly average). We know this means 1 to 3 reps in the tank on all work sets. Start your session by working up to your top set. In this example, that’s a set of 3 at a 9 RPE. Let’s say you do 405. Now you apply your fatigue percent. If you subtract 5% from your top set, you get about 385. What this means is that you will continue to work until 385 for 3 reps yields a 9 RPE. This is a 5% loss in your ability to move weight and it correlates with a certain level of fatigue. This may require many sets or only a few. Each workout will be different, as will each movement. But that’s the point – your volume will automatically adjust up or down to accommodate what your body can handle. This will help you avoid overtraining and ensure that you’re getting enough volume for adaptation to occur. I like to teach with examples, so let’s work through a hypothetical situation. Let’s say our lifter is supposed to squat, doing sets of 2 reps at 8-9 RPE’s, with a 5% fatigue percent. So he goes to the gym, fills up his water bottle and stakes out his power rack. The poor guy trains at a commercial gym, so he has to wait until the shrug brothers finish their shoulder-spasms (hey, it’s my hypothetical situation – I can do what I want). When he finally gets settled in to the rack, he goes through his warm-up the way he normally does. The warm-up is followed by a work up to the heaviest weight of the day – in this case a weight that he will do a set of 2 reps that results in a 9 RPE. Let’s say our hypothetical lifter gets up to 525×2 @9 RPE. At this point, he applies his fatigue percent – 5%. He finds that 5% of 525 is about 26 pounds. So he subtracts 26 from 525 and rounds it to a weight he can load – 500. What this means is he will keep working until he does 500×2 @ 9. This shows a 5% loss in his ability to lift. There are a few ways to go about reaching that level of fatigue. The simplest way is to load 500 pounds and do repeated sets of two reps until the RPE climbs up to a 9. At that point, you would stop. The other way is to slowly descend the weight, doing a double on each set, until you get down to 500×2 @9. It doesn’t much matter how you arrive at 500×2 @9 – only that you get there. If this sounds like an easy system to cheat on, you’d be right. If you’re a lazy person, this isn’t for you. If you have to be pulled out of the gym with a pry bar, this probably isn’t for you either. This method caters to those I call “controlled-aggressive”. You have to be willing to work hard – very hard – to achieve your goals. But if you’re more interested going nuts than being productive, there’s not much any system can do for you. Simply put, if you work hard to get stronger, but you also put some thought in your training, this system can be helpful to you. One thing to keep in mind – keep your rest intervals under control. There will be a wide range of effective rest intervals, but if you rest too long for the intensity of work you are doing, you will never get the fatigue you’re after. The key to mitigating this is just to pay attention. Don’t take 10 minutes between sets unless you have a good reason! RPEs play a critical role in implementing this system of training for both intensity and volume. For a deeper understanding on how to use fatigue percentages, including information on how to vary the percentages in accordance with your training goals, check out the Reactive Training Manual or visit our forum at ReactiveTrainingSystems.com. There is a lot we can all learn from one another, so join in the discussion! If you decide to take the leap and use RPE based intensity and fatigue base volume programming, I bet you’ll be happy you did. This style affords you greater control based on how your body is responding to training and it does it in real-time. This is a very powerful tool and can help you bust through your PRs! If you’d like to take your understanding of RPE to the next level, I encourage you to check out the RTS Manual. Or if you prefer video, check out the more recent RTS Modification Series. Mike Tuchscherer is the owner and head coach at RTS. He has been powerlifting since 2001 and since has traveled all over the world for competitions. In 2009, he was the first man from USA powerlifting to win a gold medal at the World Games – the highest possible achievement in powerlifting. He has coached over a dozen competitors at the world championships, a score of national champions, and multiple world record holders. © 2018 Copyright Reactive Training Systems. All Rights Reserved.